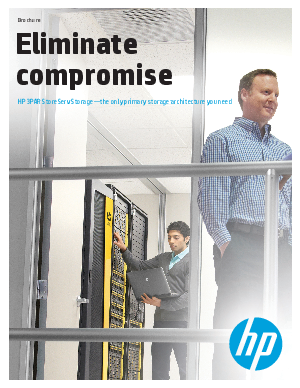 HP 3PAR StoreServ Storage is the only primary storage architecture you will ever need—regardless of whether you are a midsize enterprise experiencing rapid growth in your virtualized Microsoft® Exchange, Microsoft SQL, or Oracle Database environment, a large enterprise looking to support IT as a Service (ITaaS), or a global service provider building a hybrid/private cloud. IT has never been more important to doing business, which means that IT infrastructure must be simpler, smarter, faster, more flexible, and more business-aligned than ever. The world is moving rapidly towards a New Style of IT, and will leave behind any business that doesn’t adapt even more rapidly. Is your storage ready?